10 years ago (9/4/2006) I filmed Dave MacLeod making the first ascent of Rhapsody (E11) at Dumbarton Rock on the outskirts of Glasgow. I’d been following his progress on camera for just over a year, this became my first major film ‘E11’. This route and film has had a massive impact on my life. When I started filming Dave, I was still working fulltime in my IT desk job (VB programmer if you are interested!). I was bunking off work and calling in sick in order to film MacLeod’s attempts on the route. I remember the day after he made the first ascent, I was back at my desk, fully recovered from by imaginary stomach upset, but I was feeling really down after the highs of the day before. Two months later I was still in the same job, still depressed. Then one warm day in June 2006, I was on my lunch hour lying on the grass in Princess street gardens, when I decided to quit my job. I didn’t even give notice, I just walked back into the office, pulled by team leader into the corridor and told him that I was going to call in sick tomorrow and I would not be coming back! It is hard to sum up the last 10 years, but it's fair to say I’ve have some fun, I've been to some cool places, I've met some lovely folk and I've got to create films, some of which I am reasonably pleased with, but it has also been incredibly stressful and sometimes depressing. Keeping Hot Aches running and producing films has definitely meant scarifying my own climbing, my financial status and even my health to some extent. Hardly seems worth it… its just filmmaking after all and just films about climbing FFS! Yet I felt compelled to continue. Will I still be doing this in 2026? I doubt it… but then I’ve still got a few films I need to make. Since 2006 I’ve been back to film Rhapsody a couple of times, firstly I filmed Sonnie Trotter climb it in 2008 and then James Pearson in 2014. I think it is still a very impressive piece of climbing, and I think it may prove to be seen as futuristic for 2006. Since then there has been very few new trad routes with such hard climbing (French 8c / 8c+). Or watch the film of James Pearson climbing it to achieve his own personal ‘Redemption’! Thanks to Mountain Equipment and Wild Country for sponsoring my 'Now That's What I Call a First Ascent' youtube series. Now That's What I Call A First Ascent! Now That's What I Call A First Ascent ... This series features six of the best first ascents we have filmed over the last 10 years. The series is sponsored by Wild Country and Mountain Equipment. We've been out filming this winter for our upcoming film 'Transition' featuring Natalie Berry and Dave MacLeod and supported by Mountain Equipment. The film follows Natalie's move from indoor and sport climbing to trad, winter and alpine. We went on a couple of shoots last summer, including a ten day trip to the Isle of Lewis for trad climbing on the sea cliffs but this was our first opportunity to get out into the winter environment. We've put together a short film preview of some of the routes we've shot on the project so far. Check it out below. 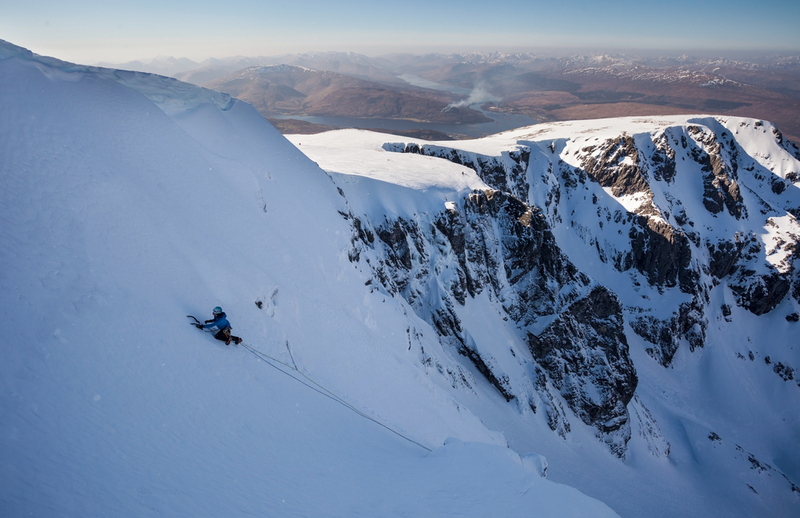 Below is a quick summary of the winter routes we've shot for the project this winter. The first winter shoot of the season saw us heading to Beinn Dorian near the Bridge of Orchy. We'd heard that 'Messiah' (VII 7) was in good condition but unfortunately we were beaten to the route by two other parties so instead opted for 'The Promised Land' a nearby grade VI. Diff and Ali Rose (our guide for the day) headed to the top of the route to rig a rope for filming whilst Nat and Dave climbed up the first easy pitches and I set up camera position the slopes below. The meat of the route was contained in the top two pitches with great climbing on mixed ground and ice. Despite being blasted by the wind all day we managed to get some great footage of Natalie's first winter route, topping out as the sun set. A week after shooting on 'The Promised Land' we headed back to the Bridge of Orchy area again, this time to Beinn Udlaidh, an easily accessible venue with lots of potential for new routes. Donald King joined us as guide and Geoff Fortescue as second cameraman. Dave and Nat spotted a couple of potential lines on the unclimbed lower tier and after some deliberation decided on a steep icicle route with a section of mixed at the start. Things started to warm up very quickly as we arrived at the base of the route and the ice started to melt (a wetsuit quickly becoming a more appropriate clothing option). Fortunately the pitch was quite short and we managed to finish shooting and head back to the van by 2pm, a very relaxing shoot day in comparison to the usual Scottish winter outings! Due to various mishaps over the years Dave was due to head off to Germany for ankle surgery at the end of March with a couple of months off climbing after that. The day before Dave was due to leave we managed to fit in one final winter shoot on Ben Nevis, which due to a good period of freeze-thaw cycles meant a number of rarely formed ice routes were in great condition. We opted for 'Pink Panther' a VI 6 on the Upper Cascade area first climbed by Godefroy Perroux that hadn't had many repeats. Fortunately we were lucky enough to get near perfect weather (a rarity for Scotland! ), which made our filming job much easier. Diff and our guide Julie headed up to the plateau to rig ropes whilst we sat in the CIC drinking tea and sharpening axes. After a quick slog up Number Two Gully we arrived at the base of the route. With a bit of effort I was able to dig out a perfect filming ledge that gave a great view of the route. Dave led up the first crux pitch on great ice before Natalie led through and up the final pitch to top out onto the plateau in the sunshine (something I couldn't appreciate stuck in the gully below!). Dave's blog about Pink Panther is here. The Rolls Royce of camera positions. Dave on the first pitch of Pink Panther (Photo: Paul Diffley). With three great winter shoots in the bag we're now looking forward to the summer and more trad climbing both in Scotland and further afield. We'll be posting regular updates on our Facebook page.